at least Batman also has Bruce Wayne, giving him all of two dimensions. Dredd is just Dredd. I think the character is now as relevant to the new century as Dan Dare was to the 1970s. Now, leaving aside the number of dimensions the characters have, and whether that makes them better or worse for stories (though I think Dredd, as written by John Wagner and a couple of other writers who get the character, a list which definitely doesn’t include Morrison, is a far more nuanced character than is usually believed), who could really believe that a fascist authoritarian police state which exercises seemingly unlimited violent power, in a world where the citizenry are regularly gripped by senseless, meaningless, obsessions which destroy thousands of lives for no good reason is irrelevant to the twenty-first century? Perhaps it’s the way in which the world is hugely overpopulated but humanity has destroyed most of it and clustered in crowded, angry, cities that is irrelevant? But then, Morrison was saying this a few years ago, back when theses about the “end of history” didn’t sound cretinous, and when there was a sense of optimism that maybe Western society wouldn’t completely give in to its basest, crassest, instincts. So we can cut him a bit of slack. But one thing I’ve been thinking of recently is a Judge Dredd story that seems more relevant to the current age than, frankly, everything Morrison has ever written (and, again, I love Morrison’s work. I’ve written two books about the man, or three depending how you count). It’s the first Judge Dredd story I ever read. 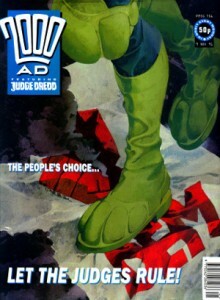 More accurately, the first Judge Dredd story I ever read was the very last part of it. I got into 2000AD oddly for a British kid – it always looked a little too childish for me as a kid, but then after the “Bam! Pow! Comics aren’t just for kids any more!” hype of the mid eighties, I slowly started getting into American comics. Only when I was thirteen did I realise that the writers whose work I was most excited by – at the time Alan Grant, Peter Milligan, and Alan Moore in approximately that order – were all 2000AD regulars or had recently written for the comic. Twilight’s Last Gleaming, the Dredd story that concluded in that issue, was written by Garth Ennis, but was the conclusion to a subplot that had been running for five years, started by Dredd co-creator John Wagner and his 80s writing partner Alan Grant, and continued by Wagner. Judge Dredd is unusual in mainstream comics in that, for most of its most popular period, it changed registers quite freely. About half the time it was grotesque, over-the-top, farce completely unconnected to anything in the real world, while the other half it was attempting serious-minded, grim, action stories. The experience of reading it as a week-by-week serial could perhaps best be likened to watching a Batman film where half the scenes were from the 1966 series and the other half were from The Dark Knight. Letter From a Democrat had originally been intended as one of the grotesques. Under the title Letter from a Baffin Island Nudist, it had been planned as a story about nudists taking over a TV station and coming into conflict with Dredd. 2000AD editorial apparently decided that this was not appropriate for a children’s comic, and so Wagner and Grant took the idea of taking over a TV station and went in a different direction, ending up with pro-democracy activists taking over to protest the fascist regime of the Judges. 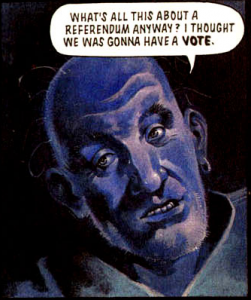 Over the next five years, particularly in stories by Wagner, Dredd came to believe that while the Judges’ fascist regime was the correct one, it had to show that it was ruling by the consent of the governed, and under increased pressure from the pro-democracy activists the regime eventually agreed to a simple, one-question, yes-no referendum on whether the citizens of Mega-City One wanted to continue with the Judges’ rule, or whether they wanted democracy. And the result was a massive endorsement of the Judges’ rule. Only thirty-five percent of people in Mega-City One bothered to vote, and because so many of them pressed the wrong buttons, the Judges got sixty-eight percent of that vote. Which meant that eternal fascist rule was endorsed, “democratically”, in a two-option vote where only twenty-four percent of the population actually supported it. But this was, of course, the will of the people. Obviously this is the kind of ridiculously over-the-top satire that may have seemed mildly amusing in the late 80s and early 90s, but which has no relevance to the new century. 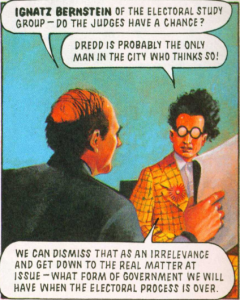 Judge Dredd, at its best, has often been either incredibly funny or incredibly moving by projecting current fads and trends to the point of absurdity. (It’s also been incredibly offensive at times, in the same way – things like the Fatties, or the racist caricatures which populate some of the earlier stories (and for which Wagner, to his credit, apologises now)). But we are living in absurd times. 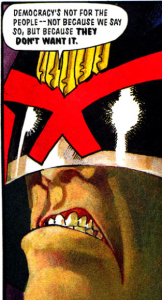 In a number of early Dredd stories, Dredd has to fight “futsies”, people who are suffering from “future shock” and have become floridly psychotic as a result. Every citizen in Mega City One has future shock, but the “futsies” have completely broken. The term comes from Alvin Toffler’s classic work of futurism in which he argues that technological changes were causing a transition between industrial and post-industrial civilisations. Toffler argues that more things would become disposable, and that the rate of change would mean that knowledge work and services would overtake manual labour. He argues that this would lead to massive unemployment among manual workers, to massive movements of people to find jobs after jobs leave their area, and to a constant need among those who do have jobs to develop new skills. He says this will cause massive problems both on the social level – as institutions can’t adapt fast enough to cope with the changes in society – and on the individual level, as people have to live in a world where the certainties of their youth are erased and replaced with something unfamiliar and new, which is itself erased before they have time to get used to it. If Judge Dredd as a series can be said to have a unifying theme, a worldview, it is this: future shock exists, and people don’t like it. They will do literally anything, up to and including nuclear war, when in its grip, and they will empower any amount of totalitarian thuggery if it offers even the slightest promise that they don’t have to deal with change any more. People want constant novelty, to distract them from their lives, but what they want even more than the illusion of change is the illusion of stability, and they are willing to go along with any brutality, any inhumanity, even their own torture and death, so long as it means they never have to think a new thought or have a new idea. It’s a bleak, cynical, worldview. In many ways it’s an adolescent one (as befits a comic developed for adolescents). It’s not a wholly accurate picture of humanity – or at least, I have to tell myself so if I want to avoid succumbing to suicidal depression, and in my more mentally stable moments I truly believe it isn’t accurate. But to say it’s not relevant? No. Judge Dredd is about the most relevant comic there is. I hope one day it isn’t. Dredd is obvs super relevant, always has been and always will be, but one thing that is not great is your U.S. election pie chart. Where did you get those numbers? They’re very wrong. 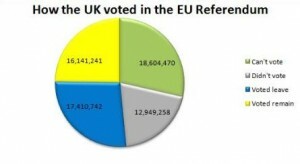 Also I’m not sure it’s intellectually honest to include babies and toddlers who did not vote for either candidate on your pie chart which is meant to show the rejection of democracy by the people. Should add that pie chart inaccuracies notwithstanding I agree with the implied sentiment of voter turnout in the US being in a sorry state. Most of that is laziness / indifference, but there is also a great deal of voter suppression that takes place here in the good old Land of the Free, USA #1, spearheaded of course by the party of Donald Trump. Left-leaning amerikaners expect these efforts to become more aggressive under his administration. Looking at the page I got the second of those graphs from, it turns out it was a preliminary estimate in early November before votes had been completely counted. 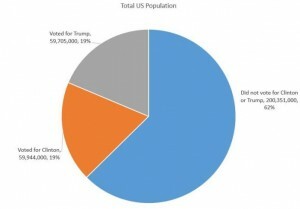 If I can find a better pie chart, I’ll replace it, but the percentages (if not the actual numbers, where Clinton’s total should be higher) are pretty much the same still. As for whether it’s intellectually honest to include babies and toddlers, possibly not — but it’s *more* dishonest, I think, to use graphs of the “eligible population”, which is the only other sort of graph I ever see there. Those don’t include babies, but they also don’t include immigrants, those who’ve never bothered to register to vote, those who are too young by a matter of days to vote, and those who have been disenfranchised for whatever (often spurious) reason. I didn’t include the images to “show the rejection of democracy by the people”, by the way — I don’t think they necessarily show that. As you say yourself, voter suppression in the US is at endemic levels, and you’re not rejecting something if it rejects you — I made a conscious choice to include those not allowed to vote as well as those who chose not to vote, for that reason. What they *do* show, though, is that what is talked about as “the will of the people” in elections and referendums is nothing of the sort. A Dredd-style cynic would say that’s because most people don’t care, while an idealist would say it’s because the system actively prevents people from expressing their opinions. This is an excellent post. I’ve always had the nagging feeling I should read some 2000AD and I think this has clinched it for me. Where do you think I should start? That’s probably a whole post in itself. Douglas Wolk has a post on where to start with the character of Dredd — http://dreddreviews.blogspot.co.uk/2012/06/where-to-start-reading-judge-dredd.html — and I’d largely agree, though I’d point out that Complete Case Files 05 is still very much from the period when the comic was squarely aimed at 11-15-year-olds, so should be read in that light. Other than Wagner and Grant, who are responsible for the bulk of Dredd (and pretty much everything Wolk recommends there) the other major voice who made 2000AD is Pat Mills — of his work, the stuff I like the best is Nemesis the Warlock (far future satire about totalitarianism, like Dredd), but many people rate Slaine: The Horned God (basically Conan with Celtic myth), which was Simon Bisley’s first art for the comic. The two most highly-regarded non-Dredd storylines are probably Zenith (four volumes) by Grant Morrison and Steve Yeowell, and The Ballad of Halo Jones (two volumes published of what was a projected nine) by Alan Moore and Ian Gibson. Moore and Alan Davis’ DR & Quinch is stupidly funny. Zombo, by Al Ewing and Henry Flint, is also stupidly funny, and more modern in style than the 80s stuff I’ve been recommending. Zaucer of Zilk, by Ewing and Brendan McCarthy, is psychedelic wonderment.